The Beijing 4th World Conference on Women is often characterised as a high-water mark in the collaboration between Caribbean governments and the women’s movement. In the preparation for this Conference, women’s rights activists influenced political leaders in the analysis of the status of gender relations and in the articulation of strategies for gender equality. With the emphasis on institutionalising a whole-of-government accountability, the following years saw attention to national gender policies that would confirm the values of equality, and outline the practical and strategic measures to change the lives of women and girls. This was accompanied by a demand for increased women’s political representation seen as an end in itself, as well as making gender justice more likely. But this period was also defined by a concern over boys’ underachievement in education. Expressed colloquially as ‘what about the boys?’, this anxiety seemed, to feminists, a disingenuous response to women’s activism for gender mainstreaming, as if a focus on women’s empowerment was a zero-sum outcome for men and boys. Negotiating Gender, Policy and Politics in the Caribbean, edited by Gabrielle Hosein and Jane Parpart, captures the dynamics of this post-Beijing period. The book also provides some evidence of the decidedly mixed results which have been realised in the Anglophone Caribbean in the pursuit of state accountability. In its ten chapters, the book focuses on efforts to increase women’s participation and influence in parliamentary politics through special measures such as quotas, and capacity development and support to women as transformational leaders. Also examined is the development and adoption of national gender policy documents, which the editors argue, have the potential to alter gender relations. Through a series of carefully documented studies, the book explores the resulting contestations of power, and identifies the ensuing policy limitations and failures as indications of resistance to the idea of gender equality, and the resilience of masculinism, an ideology that justifies male power, and is resistant to change. Perhaps the most novel insights come from analyses of the processes of developing gender policies in Trinidad and Tobago, Dominica, and Jamaica. In the case of Trinidad and Tobago, notwithstanding the co-existence of positive factors – an inclusive consultation process; the commitment of the Minister with responsibility for gender equality; and the intellectual leadership by social development and feminist experts from the Institute of Gender and Development Studies – the draft gender policy was relegated to the dustbin by the Prime Minister, contemptuous of policy prescriptions that advanced sexual orientation and gender identity rights. If success is denoted by Cabinet adoption of policy documents, both Dominica and Jamaica achieved this. Drawing lessons from Trinidad and Tobago, the Dominican process was consciously inclusive of ‘possible outliers and derailers’, such as men’s groups and religious leaders (p. 119). Activists in neither country, however, saw the resulting policy frameworks as being sufficiently challenging of the patriarchal status quo, and sexual and reproductive rights were ignored. In ‘Masculinities and the Practice of Dominica’s National Gender Policy’, Ramona Biholar makes the point that when gender is understood simplistically as a synonym for men and women (which is how many Caribbean policymakers use the term), hierarchical power dynamics and tensions are avoided leading to a ‘jeopardized equality or an equality stripped of its equity dimensions’ (p. 141). Perhaps the bleakest insight given in the book is the failure of electoral quotas in Guyana to increase women’s participation in Parliament, or to shift gender ideology towards equality and justice. In the essay on ‘Arriving at 33%’, Natalie Persadie documents the constitutional reform negotiations that went from a demand of a guarantee of 50 per cent representation by women in Parliament to a limited law requiring only a 33 per cent inclusion of women on party electoral lists, without a mandated requirement for actually ensuring women’s participation in parliament. Despite this limitation, Natalie Persadie argues that this is an achievement which now needs women’s engagement with ‘hard’ politics to ensure accountability from political parties on quotas. Speaking to the meaning of numbers in a complementary chapter, Iman Khan also notes that electoral quotas have not ended women’s exclusion from the centres of decision-making on allocation of state resources, nor have they advanced women’s specific social, political, cultural, and economic interests. It is this ignoring of women’s demands for a comprehensive and intersectional justice that shapes the demand by Caribbean women’s movement for transformational women’s leadership. 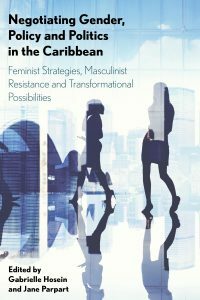 The book looks at specific women’s leaders, including the former Prime Minister of Trinidad and Tobago, in order to excavate the characteristics of such a political approach. While the chapters of Denise Blackstock and Shirley Campbell identify elements of transformational leadership (consultation, teamwork, consensus, networking, etc. ), one is left agreeing with the conclusion arrived at by Iman Khan that gender identity has made little difference to the outcome of women’s political leadership. The book’s editors conclude that masculinism has undermined gender equality strategies which are, in turn, intended to end masculinism. This paradox reflects the strengths and weaknesses of the book. As a strength, the chapters collectively transmit the truth that transforming unequal gender relations, whether through policy processes or through representation, is pure politics; it involves competing interests and power contestations. The contributors to this edited volume, however, do not give equal attention to the desired processes and outcomes of transformational feminist politics around which we must develop analysis, alliances, advocacy, and action. Neither is there enough discussion on compounded identities and the political, cultural, ethnicity, and/or socioeconomic divisions which, along with gender, explain and shape interests and politics. This is a risk because this blind spot may lead to an over-determination of gender as an explanatory factor in the fortunes of political actors who happen also to be women. What, for example, is the influence of ethnic contestations in Trinidad and Tobago and Guyana, and how do or can gender relations mediate or disrupt these power struggles? Indeed, does transformational feminist leadership offer an alternative vision to reflexive ethnic solidarity? And if so, might we not expect the patriarchal resistance to be even more vociferous from those who benefit from such identity politics? What also of the influence of the political economy? Who are these women in politics? How do they conceive the role of the state? There is, in other words, insufficient attention to context. Despite this limitation, the book makes a significant contribution to the analyses of the histories of women’s and feminist organising. It is also a timely reminder of masculinism’s enduring grip on power. And one is struck by the veracity of this statement, as well as the contribution of Caribbean feminist thinkers to the theorising of patriarchy and the state.